Topping the bill at Irvine Folk Club on Wednesday 24th April is Wildwood Jack. This will be their first appearance in Irvine and it may be of particular interest to budding ukulele players! Wildwood Jack are Jayne Freeman and Alan Piggott from Kent. They met at university and started a shared musical journey which has continued. They play ukulele and acoustic guitar with their fingerstyle playing being described as outstanding. Their repertoire of songs and instrumentals reflects their main musical influences of folk, country and world music. In 2013 Jayne and Alan sold their home and have travelled extensively playing at folk clubs and festivals, touring village halls and churches in Denmark and busking in Croatia and Italy. In between their travels they have released three albums, the most recent being Liberty Ship last year. Currently, Wildwood Jack are on a Spring Tour and as well as the Irvine Club, other Scottish venues have included Tayvallich, Ullapool, Inverness and Edinburgh. Wildwood Jack a new sound for Irvine Folk Club. Hear the duo on 24th April at Vineburgh Community Centre in Quarry Road. The Club starts at 8pm and it’s BYOB. 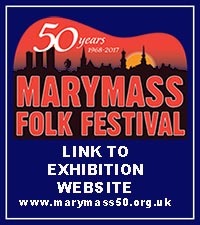 Elsewhere, Girvan Folk Festival is on from Friday 3rd – Sunday 5th May. There are concerts, a number of informal sessions, a Big Sing, a Songwriters Concert plus storytelling. Artists are many and include Brian Miller, Colum Sands, Mike Vass, Bob Fox, Cathal McConnell and Fiona & Heather Heywood. Full details at girvantraditionalfolkfestival.org or just go!